For over 150 years, the Hinkle family has protected this 375-acre plot of wilderness mountain land, filled with spectacular views and abundant wildlife. The historic Cherokee Footpath, just one of the trails on which you will ride, is known to be trod by Daniel Boone. Any time of year is the right time to visit. The changing seasons create an awesome array of colors and atmosphere that will always keep you interested and inspired to learn and appreciate more deeply. Riders often comment that it's "the highlight of their vacation." We have the most amazing, gentle, well behaved horses at Whitewater Equestrian Center!! 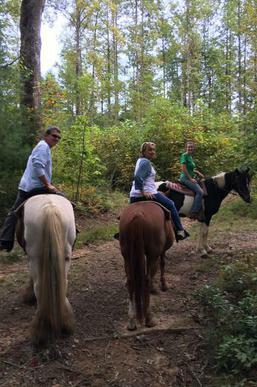 Our horses come from the children's camp and are so good with all the guests that come ride with us!